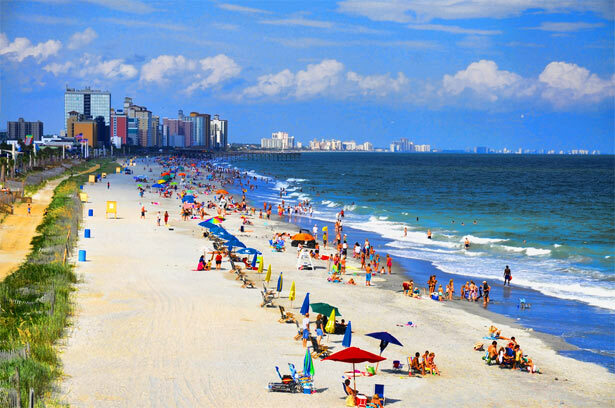 One of the most iconic areas of Myrtle Beach is its exciting Ocean Boulevard from 9 th to 11 thAvenue North. Along this stretch of seaside buildings and attractions, there is a little bit ofsomething for everyone who visits! Start your adventure down this section of Ocean Boulevard with a stop at Peaches Corner near9 th Ave. This oceanfront restaurant set up shop in Myrtle Beach in 1937. Named after the familywho first owned and operated it, Peaches Corner has been a staple of the boulevard ever since.Open year-round, Peaches Corner offers up dining specialties including their famous ClassicFoot Long Hot Dog, Peaches Burger, and Foot Long Corn Dogs. They also feature items like icecream, wings, and beer! If you take just a short walk up from Peaches, you can find the Fun Plaza, an oceanfront arcadewhere the games are numerous, and the entertainment is certain! Featuring dozens of vintageBaseball Pin Ball Machines, the arcade also has more modern games like Deal or No Deal andFlappy Bird! Make sure you take a turn at Skee-ball! After you've finished playing, take yourtickets to the cashier to claim any number of fabulous knick-knacks, candies, and other prizes.The Fun Plaza is one of Myrtle Beach's best old-time treasures, bringing fun for the entirefamily. Continue on your trek up Ocean Boulevard, and you will run into the Gay Dolphin, one of thenation's largest gift shops. With over 26,000 square ft. of shopping space, the Gay Dolphin GiftCove contains more than 70,000 novelty and decorative items for visitors. If you're looking for asouvenir during your trip to the Grand Strand, you are sure to find something unique andrepresentative of Myrtle Beach at the Gay Dolphin. These are just three of the exciting places you will find should you choose to explore this part ofmagnificent Ocean Boulevard. Make a day of it, and experience the nostalgic and family-friendly attractions in the heart of downtown Myrtle Beach.